Writing Conventions: What is the new norm? I saw this sign one day at a place I frequently visit. (See image below.) I strive to use Standard English for published pieces, and I cringe just a little when I see improper English getting published this way. Maybe I am being too critical, but it is hard to ignore how informal, and just plain incorrect language, has wiggled its way into the formal arena. It’s about audience. Writers need to consider not only the purpose for writing, but also the audience that will be reading the publication. If there is an intended audience, it should be more formal. I don’t mean to pick on the content; rather, I think we could all use some pointers about audience and formal vs. informal language. For example, in the sign, the content needs to be handled with formality without sounding stuffy. We can improve tone with this simple fix: replace the phrase “insure you” with a simpler phrase “be sure to.” That makes the message clearer and sounds less stuffy. 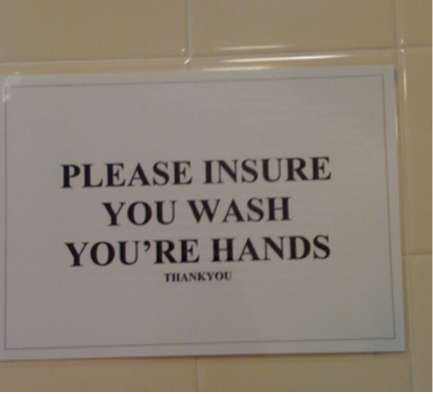 Next, pay attention to homophone pairs, such as your and you’re. Homophones sound exactly the same but have different spellings and meanings. We fuse the words you and are together to make the contraction you’re. We use the apostrophe to show where certain letters from both words have been left out. The word your belongs in this sign, not you’re. People often misuse these words because they sound the same. But if you see an apostrophe, the word is either possessive or it is a contraction. If the word is a contraction, think of the two words used to make it and say them aloud. That will help you hear the difference. In this case, we must use the word your. There are a few other issues we could address from this example, but to be clear…if a message is important enough to share with others, it is important enough to publish it correctly and to gear it to the right audience. Now, please don’t misunderstand. There’s plenty of room for informal English in our communication. For instance, informal English will work well enough in personal texts to friends and family. But, stick with Formal English to attract attention to any important message you want to share with an audience. · What do you think about the unedited format of our informal culture? · Do you believe the use of the conventions of English, which include: capitalization, punctuation, spelling, correct usage, and grammar, are critical to readability in written communication? · Where do you think this trend will lead in ten or twenty years?